So far it's been unseasonably warm, despite night frosts under clear skies, and the oaks are only reluctantly loosing their golden leaves. Even the mountain summits are still free of their usual snow. Broad beans, peas, onions and garlic are all planted in the orto, ready to sprout in the spring. Winter returns to the Marche. May your year to come be free of fear and stupidity. What better in the depth of January than a plate of the northern Marche speciality passatelli in brodo, thick strands of a pasta made from breadcrumbs, parmesan cheese, and egg cooked and served up in good, strong broth. The name passatelli comes from the fact that the dough is "passed" through a large-holed type of sieve directly into the boiling broth. To make them at home take 50 grams per person of grated Parmesan cheese and fine breadcrumbs, some grated lemon peel, nutmeg and one egg for each serving. Mix ingredients together to form a fairly stiff dough then, assuming you don't have the special passatelli "sieve", pass it through a mincer *without* the cutting blade and with the die with the largest hole to produce long "worms" of dough. In a large pan bring some home-made chicken broth to the boil and then slide in the passatelli - in a minute or two they will begin to float and are ready to serve. Buon appetito! 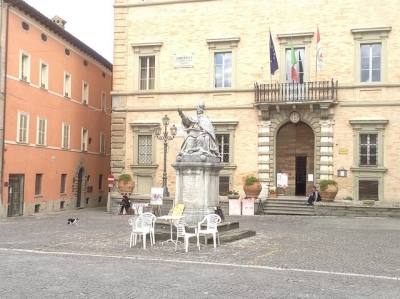 This winter's image of one of the region's piazze features the small main square in Sant'Angelo in Vado watched over by Pope Clement XIV whose family came from here. Macerata's 2016 open-air opera festival in the magnificent Sferisterio arena has the Meditteranean as its guiding theme. It runs from 22 July to 14 August and features Verdi's Otello and Il Trovatore, and Bellini's Norma. You have until 31 December to try the best white truffles in the Marche - but be warned that this year the top price has reached Euro 3,300 a kilo for the finest specimens, according to the Acqualagna "Truffle Exchange". 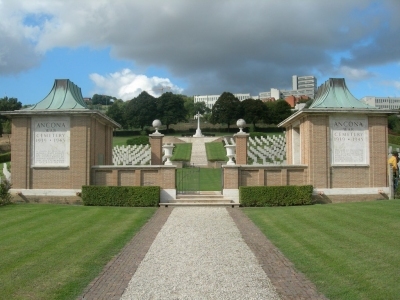 There are three Commonwealth War Graves in the Marche holding the remains of more than 2,700 Allied dead from the Second World War, mostly killed in the assault on the Gothic Line in August and September of 1944. They are, from north to south, at Gradara, Montecchio and Ancona. A visit to these peaceful, impeccably-tended cemeteries remains a poignant and tourist-free experience. Initial figures from the regional authority for the period from January to August, suggest 2015 was a good year for tourism in the Marche. The region played host to 1,866,252 visitors during the period - an increase of 2.88% on 2014 - although the number of foreign tourists decreased slightly by -0.2%. A record nineteen wines from the Marche managed to win Gambero Rosso's prestigious Tre Bicchiere awards for Italy's finest wines for 2016, eleven of which are outstanding examples of verdicchio. Madame de Staël's Corinne, or Italy (1807) - one of the first European romantic novels written by a woman - features a dramatic chapter set in Ancona.